Can an exercise of democratic elections jeopardize a nation’s foreign relations? Not necessarily, but when combined with the non-democratic exercise of foreign policy, it probably can. The 2017 presidential elections in Kyrgyzstan, much praised as a rare case of peaceful power transfer from one elected leader to another in Central Asia, has also gained prominence for its major foreign policy implications. In the heat of campaigning, the Kyrgyz president loudly accused Kazakh authorities of meddling into the domestic affairs of Kyrgyzstan. This was a reference to Kazakh President Nursultan Nazarbayev’s publicized meeting with a Kyrgyz presidential candidate, who happened to be the key rival to former Kyrgyz President Almazbek Atambaev’s hand-picked successor. 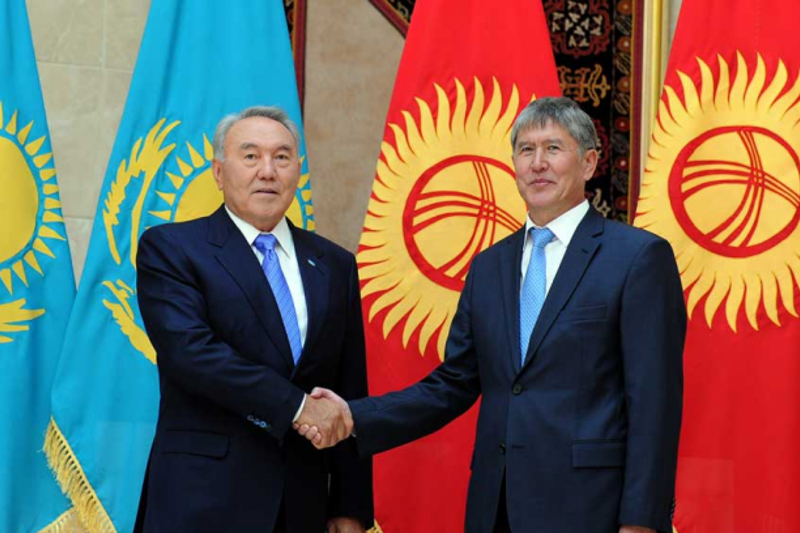 Atambaev accused Kazakh oligarchs of illegally funding Kyrgyz opposition campaigns, while also throwing painful comments on Kazakhstan’s own affairs, including Nazarbaev’s not so young age. Kazakh authorities responded in a comparable spirit, declaring its commitment to centuries of Kazakh-Kyrgyz friendship before effectively shutting border checkpoints between the two countries. Traders suffered the most, as major Kyrgyz highways connecting Kyrgyzstan to Russia and Europe cross through Kazakhstan. The IMF forecast a slight decrease in Kyrgyzstan’s GDP growth for 2017 unless the border was reopened promptly. The latter only happened in December, after the face-to-face meeting between Nazarbaev and newly elected Kyrgyz President Sooronbai Jeenbekov. A war of words and border closure between Kyrgyzstan and Kazakhstan caught many off guard. The two states tend to regularly claim brotherly relations, bound not only by geography but also a shared history, culture, and language. Unlike the more typical descriptor of friendship, however, brotherly relations imply some sort of a hierarchy. Kazakhstan might have been a larger or richer, but some Kyrgyz are keen to remind of their more ancient history. More often than not, however, Kyrgyz-Kazakh discursive battles were more the domain of friendly jabs than serious politics. At least, before 2017. This flare-up of bilateral tension triggered various interpretations. For some, the problem was an ad hoc one, merely caused by the careless vocabulary of one president. For others, the real issue behind the border closure was economics, with Kazakhstan keen to stop “gray” Chinese imports via Kyrgyzstan. The yawning difference between Kyrgyz and Chinese estimates of bilateral trade seems to point to the scale of informal trade, an issue that Kyrgyzstan would have to address sooner or later. Others pointed to the fragility of the Eurasian Economic Union: the closure of trade between the two member states prompted no reaction from other Union members or the Eurasian Economic Commission. All are plausible arguments, revealing the precarious nature of eternal friendship and brotherhood. But two additional dimensions deserve illumination. First, the bilateral standoff suggested the risks of truly contested elections. Unlike many presidential contests in the region, the 2017 elections in Kyrgyzstan appeared hardly predictable. When votes are actually counted, the means employed in campaigning get dirtier. Was former candidate Omurbek Babanov, or any other candidate, benefiting from funds of foreign oligarchs? These were just claims; but if true, it would be not only illegal but also have serious implications for Kyrgyzstan’s sovereignty, especially given the political roots of oligarchs in Kazakhstan. On the other hand, what was the electoral impact of Atambaev’s loud accusations of Babanov being a henchman of Kazakh oligarchs? While data is scarce, arguments abound in Kyrgyzstan about Kyrgyz-Kazakh relations being sacrificed for the sake of affecting voter preferences. Either way, contested elections with no obvious front runner emerged to be consequential for the state’s foreign relations. Second, the incident also revealed how foreign policymaking in both countries remains opaque and instrumental for political goals. Atambaev’s comments on Kazakhstan and its president came at various public events, in an unrestrained style reminiscent of a certain well-known, politically inclined Twitter user. Kazakhstan’s responses were more reserved, but not more transparent. Official explanations for the border closure evolved in the process, from “routine operations” to temporary measures for the duration of elections in Kyrgyzstan to efforts to curb informal trade from China, demonstrating opaqueness and, consequently, the non-accountability of policy processes. Thus, the Kyrgyz-Kazakh spat pointed to security implications of having non-democratic policy making in the context of contested elections. Politicians exchanged words, but it was ordinary citizens who had to bear the costs, from agriculture producers and traders in Kyrgyzstan stranding for weeks at checkpoints to Kyrgyz migrants in Kazakhstan subjected to unscheduled document checks. The way how the problem emerged was somewhat new and novel for Central Asia. The solution, however, seems to lie with the same old institution-building and rule of law, themes that are so familiar as illusory in the region. Shairbek Juraev is an EDSN Fellow and a Marie Curie Fellow at the School of International Relations of University of St Andrews. EDSN is an international project of the Center for Social Sciences, Tbilisi, and made possible with generous funding from the National Endowment for Democracy.